Suppose I offered you an insurance plan that covered inexpensive things but left you hanging anytime you needed something that was really expensive? Would you buy it? That brings me to the subject of Medicare prescription drug (Part D) plans. How helpful are they for most seniors? Part D plans certainly appear to be helpful when seniors buy prescription medications, but most really aren’t. The reason they appear to be helpful (but usually aren’t) is because people are largely unaware of the fact that most of the prescription drugs they buy are surprisingly inexpensive (often pennies a pill). This is why people can be fooled into thinking their plan is helping them purchase a medication when, in reality, their drug plan is paying little, if anything for that medication. What about when a person needs an expensive medication, though? I then explain to them that the one medication that isn’t “covered” is the only medication they take that really costs anything. I also show them that the prices they’re paying for each of their medications with the “help” of their insurance are no less (and sometimes a lot more) than what they might pay if they didn’t use their insurance and paid cash instead. There are exceptions to this. There are Part D policies that really do cover expensive medications, but I find that my patients who have these policies usually get them as a retirement benefit from a former employer who offers good benefits. Either that, or they pay far more than the normal premium price for their policies (usually two to three times as much in monthly premiums). My patients who purchase their Part D plans for themselves at the normal price almost never get any significant help from these plans when buying their prescription medications. To show just exactly what I mean, here is the case of a patient of mine who had a “catastrophically expensive” medical condition; she received a liver transplant for liver cancer in June 2017. I think most people are aware of the fact that liver transplants are complicated and very expensive, so it shouldn’t surprise anyone that she was prescribed a lot of medications that year. In fact, she was prescribed a total of 27 medications in 2017 that related to her transplant as well as for other medical conditions. I itemized each medication she was prescribed, how much she paid, how much her insurance paid, the average cost to the pharmacy for each medication the month my patient bought it and, finally, what her cash price for each medication might have been had she not used insurance. To begin with, she was prescribed three anti-rejection medications: tacrolimus, mycophenolate and prednisone. All three medications are generic and all three medications were covered by her Part B benefits, so she didn’t actually need prescription drug coverage for these medications. Still, if she had no “coverage” the 600 tacrolimus capsules she was prescribed that year would have cost her about $150, the 240 mycophenolate capsules would have cost about $56 and her 90 prednisone pills would have cost about $10. She used her Part D prescription drug plan to “help” her purchase the other 24 medications she was prescribed that year. Her plan is SilverScript and she pays about $28.50 per month ($342 a year) in premiums for this “coverage.” Let’s see how much her plan really helped her. Her plan does mail her a statement each month that shows how much they paid and how much she paid for each prescription she purchased that month. Using those statements, the statements from her pharmacy (showing how many pills she got with each prescription) and CMS’s database showing the average price (NADAC price) all pharmacies in the U.S. paid for each of those medications she purchased, I can tell exactly how much help she got that year from SilverScript. First, 21 of those 24 medications were very inexpensive generic medications. Her insurance paid exactly nothing for eight of those medications (she covered the entire cost with her copays alone) and her insurance paid less than half what she paid, on average, for the other 13 of those medications. The list of those medications as well as how much of each medication she bought and how much she, her insurance and her pharmacy paid is here (and below). Table 1: *The GoodRx price is the current lowest price for each of those medications if the amount shown were purchased all at once. As you can see from this table, her insurance paid less than half the amount she paid for all 21 of those medications. Her insurance paid a total of $109.96 and she paid a combined total of just over $257 for all of those drugs. What’s more, the cost to the pharmacy for all of those medications was about $212, so her copayments more than covered those costs. There are only three medications on that list where her copay didn’t exceed both the pharmacy cost and what her insurance paid for the drug. Also, keep in mind that she paid $342 in insurance premiums that year which should be added to her out-of-pocket costs for these medications. Okay, that was for 21 of the 24 medications she used her Part D plan to “cover.” What about the other three medications she was prescribed? The one really expensive medication that she needed that year was valganciclovir. Valganciclovir (generic valcyte) is an anti-viral medication given to most transplant patients to prevent them from getting a life threatening virus called cytomegalovirus. Valganciclovir has been available in generic form since April 2015, but it’s still rather expensive. 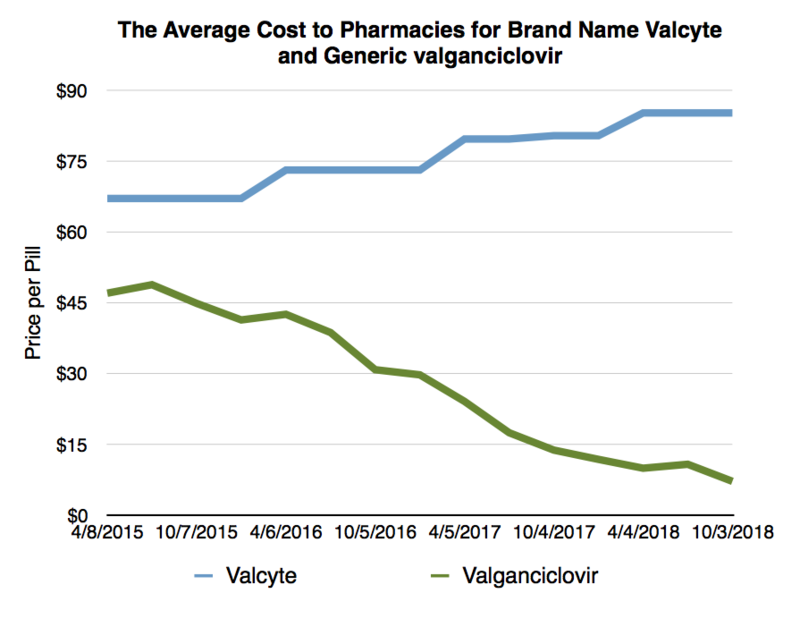 The graph below shows how much pharmacies have paid for both generic valganciclovir and brand name Valcyte each quarter since it became generic in April 2015. Figure 1: The average price pharmacies in the U.S. paid for both brand name Valcyte and generic valganciclovir each quarter since April 2015. As you can see from the above graph, generic valganciclovir is far less expensive than its brand name version, and the price has been dropping quite steadily over the past three years. Still, it’s hardly inexpensive. Even now, 60 pills (which is a one month supply for most people who need it) costs nearly $500. 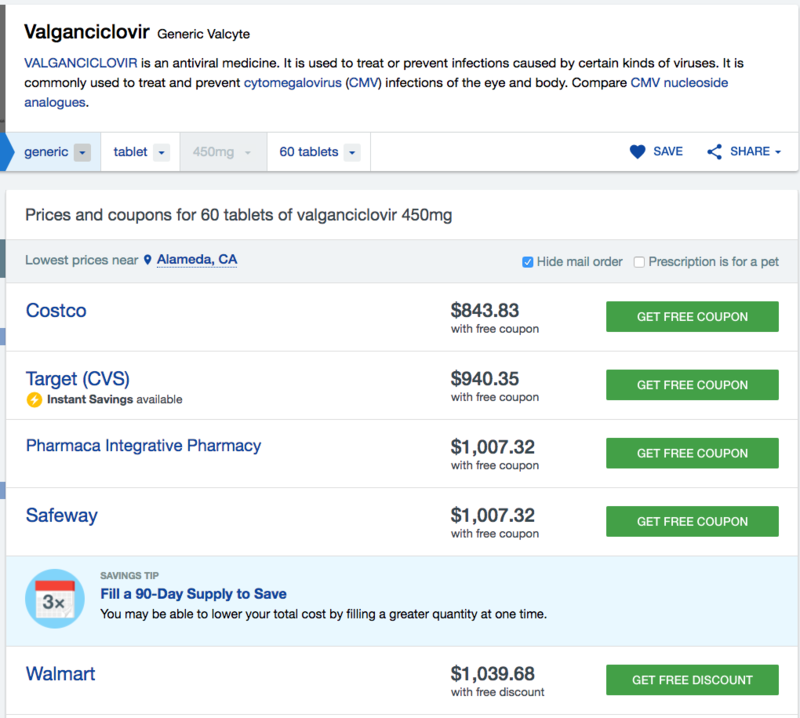 Last year, when my patient needed it, valganciclovir cost nearly twice as much as it does now. So how much did her prescription drug plan “help” her in purchasing her one really expensive medication? Not much or, rather, not at all. Figure 2: The GoodRx prices for a one month’s supply of valganciclovir in September 2017. As you can see from the above figure, I was able to get her a nearly $400 discount off the price her insurance got her for this medication the month prior (after searching for less than a minute). There were two other medications she was prescribed that year. She was prescribed 112 capsules of loperamide, which is generic Imodium; a medication for diarrhea that can be purchased over-the-counter for about $10. The prescription for this medication cost her $17.07, though. She also got a prescription for a low dose sleeping pill called temazepam. Temazepam is actually very inexpensive if you buy the 15 or 30 mg dose. Both cost about $10 for a month’s supply. In fact, most prescription sleeping pills cost about $10-$15 for a month’s supply. Unfortunately, she was prescribed the 7.5 mg dose of temazepam which, for no reason whatsoever, is extremely expensive; about $3 a pill! In this case, though, her insurance covered the cost of the medication. In fact they more than covered it since they paid nearly $200 ($199.33) for 40 capsules, when the cost to the pharmacy for this medication was only $128.99 that month. Oh, and my patient still paid a $34 copay for that medication. Why? Who knows. What have we learned from this one case? That my patient’s insurance plan; a federally-approved plan that she bought specifically to help her purchase prescription medications, didn’t help her one bit in this rather complex medical case. If anything, they increased her out-of-pocket costs overall. And she paid about $28.50 a month for that benefit. Now, this was for a liver transplant, which most people would consider to be very expensive. Are there other catastrophically expensive medical conditions for which this plan might have been more helpful? Maybe, but it’s impossible to know since there’s no way of knowing what any of these plans might cover in advance. Certainly this patient was left hanging the one time she really needed her insurance. For 2018, her prescription drug plan has helped her even less. She’s only needed three prescription medications this year and, so far, her plan has kicked in about $10 toward her medication costs while she’s paid more than $190. Now this rather extreme example demonstrates what I see every day in my practice: Part D plans that are purchased by seniors at the average price of about $30-$35 a month only pretend to offer any real coverage- and those are the most common type of Part D policies sold. What that means is that most Part D policies are, effectively, junk insurance. Why do these policies exist, and why do so many seniors buy them? Because nearly everyone is convinced that all, or nearly all prescription medications are really expensive when, in fact, nearly nine in ten prescriptions filled in this country (87%) are for inexpensive generic medications. By perpetuating this myth- that most prescriptions are really expensive- insurance companies can continue to sell policies that only pretend to cover medications. In reality, these policies pay nothing, or next to nothing, for most of the medications they “cover” and often leave people hanging whenever their prescription is actually expensive. To summarize: Most prescription medication plans sold to seniors in this country are just a scam based on a myth.